The World Health Organization recommends that children get at least 60 minutes of moderate to vigorous physical activity every day, but too many children do not. Research shows that in addition to health benefits, physical activity is also linked with improved academic outcomes. This indicates that schools can play a crucial role in helping students reach their full academic and health potential. Schools offer a wide range of physical activity opportunities for students. Increasing the type and amount of physical activity opportunities in schools could help make physical activity an everyday experience for all American children. However, there is limited knowledge about how schools prioritize and implement physical activity strategies and how they succeed in helping students meet or come close to meeting related recommendations. This project will investigate how schools make decisions to provide physical activity opportunities so that students can meet their recommended daily 60 minutes of physical activity. Using a case study design, we will interview teachers, principals, and other school staff about how their schools make decisions related to the implementation of physical activity and the reasons for those decisions. Information on decision-making in low resourced schools is especially needed, given the well documented disparities in physical activity opportunities, and the need to eliminate child health disparities and increase health equity. We will identify, recruit and select schools that can serve as models of physical activity practices that can help students meet the 60-minute recommendation. We will invite schools to participate through advertisements, mail, emails and selected networks of stakeholders in the education and health arenas. We will focus primarily on elementary schools because physical activity practices at this grade level have been associated with increased physical activity, lifelong habits are cemented early in life, and elementary schools may have more flexibility for physical activity programming. We will conduct semi-structured telephone interviews to obtain in depth information about decisions on the implementation of physical activity practices within the context of those schools. 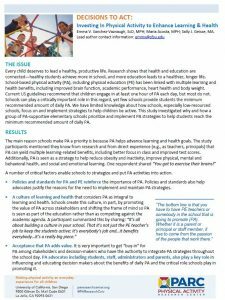 The study results have the potential to inform the course of school physical activity programming, promote a culture of health and improve child health across the nation. We expect to generate a research report to summarize the study findings and make those findings accessible and compelling to decision makers. We also plan to develop a manuscript for publication in a peer reviewed journal and a one-page brief featuring key findings and recommendations, translated into Spanish as needed. We plan to distribute our findings to a wide range of audiences, including but not limited to teachers, principals, parents and policy makers in both health and education. The research products will be disseminated to local, state, and national audiences, including schools, districts, counties, and state agencies, along with policy and decision makers. Additionally, we plan to communicate our study findings through press releases, list-serves, and print and internet media presentations at conferences attended by educators and or policy makers. We will widely advertise our materials to relevant organizations including Voices for Healthy Kids, and others working to improve child health and educational outcomes. The research report and brief will additionally be made available to the public through websites of interested organizations (for example, Salud America! network to prevent obesity among Latino children, Voices for Healthy Kids; Children Now, State Boards of Education, Teacher’s associations, and PTAs). 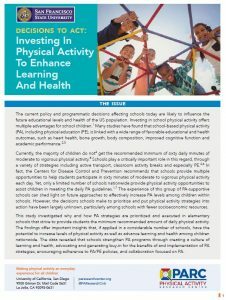 Decisions to Act: Investing in Physical Activity to Enhance Learning and Health – The 14-page full report (PDF) summarizing why and how physical activity strategies are prioritized and executed in elementary schools that strive to provide students the minimum recommended amount of daily physical activity. A 2-page lay summary (PDF) highlighting the main findings from the full report is also available. Investing in Physical Activity at School – Emma Sanchez-Vaznaugh spoke with the State of Obesity website about the study findings on how elementary schools can better support physical activity for students.